Last week, India’s Congress party president, Rahul Gandhi, appointed his sister, Priyanka Gandhi, as the general secretary in charge of eastern Uttar Pradesh (UP) ahead of the general elections scheduled for this summer. Priyanka’s entry into politics is likely to have a significant impact on the outcome of the UP elections and, therefore, the country. Important towns like Gorakhpur — from where the current Bharatiya Janata Party (BJP) Chief Minister Yogi Adityanath hails — and the holy city of Varanasi — from where Prime Minister Narendra Modi had stood for elections and won in 2014 — come under eastern UP. Last fortnight, key players in UP, Akhilesh Yadav (Samajwadi Party) and Mayawati (Bahujan Samajwadi Party) had entered into an electoral alliance that apportioned to themselves 38 seats each. The Congress party to which the Gandhis belong were taken by surprise by the new-found friendship of their erstwhile allies, which effectively excluded them from the political reckoning. UP has 80 parliamentary seats and holds the key to the power equations in the country. It is against this background that Priyanka enters the stage. It is a rather unexpected development though the possibility had always lurked, like a shadow beyond the line of vision. Priyanka has for long been on the sidelines. A voluntary position, we have been told time and again. There have been frequent and vociferous demands from the Congress cadre for her to lead from the front. But the Gandhi family had been reluctant to field her. The reason for that is not far to seek. It was to give Rahul time to flower in the harsh sun of Indian politics. Rahul, for his part, took his time. Nearly a quarter of a century, in fact. But, flowered he has, if the last few months are any indication. Rahul’s public speeches and parliamentary performances are proof of his transformation and resolve to present himself and his party as an alternative to Modi and the BJP. In other words, Rahul is no longer an onlooker. He is a player, and now behaves like prime ministerial material. Priyanka speaks very well. And she is warm in her approach to people. That she took her time to move into limelight officially and at the instance of her brother is proof that the Congress party is working to a plan. That the Gandhi family stands united sends a vitally restorative message to the party workers. It is not clear yet what Priyanka’s strategy would be in UP. As of now, the signs are that under her leadership, the party will go it alone in the state. It has a lot of ground to cover. The Congress was drubbed in the last general elections — in 2014 — and again in the 2017 assembly elections. They lost out on community votes: Muslims and Dalits (lower caste). The alienating performance of Adityanath has since come to the Congress party’s aid. The reassuring image remake of Rahul, too, is likely to consolidate the secular votes of the state against the BJP. But it is not clear exactly how the alliance of Yadav and Mayawati will influence the electoral outcome. If Priyanka is able to turn the tide and garner even, say, 20-25 seats, she would emerge as a hero. And if the Congress, at the head of an alliance, is able to stage a comeback to the Centre, Yadav and Mayawati will tag along. Power has the ability conjure order from chaos. Yadav and Mayawati believe that joining hands with the Congress party do not accrue benefits to them as in any electoral understanding, the Congress party’s share of votes is not transferred to them. Which is what happened, Yadav says, in the 2017 state assembly elections. Maybe. But if the party under the leadership of Priyanka is able to take away or whittle down Yadav’s or Mayawati’s share, the case would be altered again. Which is why the announcement of the alliance between Samajwadi Party and Bahujan Samaj Party might have been a bit premature, and their aim to isolate the Congress counter-productive. It certainly seems to have triggered the introduction of a new factor in the equation: Priyanka Gandhi. Priyanka looks all set to galvanise the gig. In naming her as the general secretary for eastern UP, Rahul has been advised boldly and well. 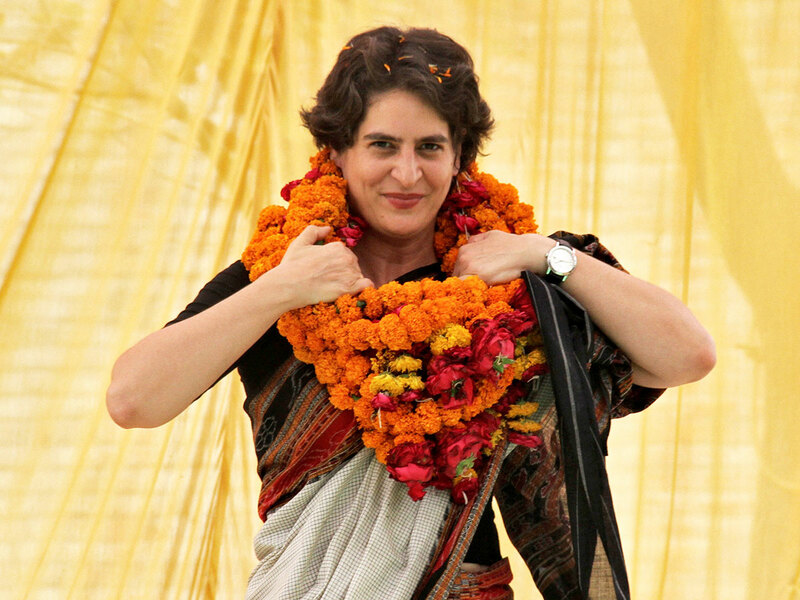 Priyanka’s entry into politics is a sign that the Congress party is not incapable of taking risky decisions, and that its ways are not set despite its hoary past. The 2019 elections promise to be an exciting show. Who knew India’s first and oldest political family would throw their all into the battle? Stay tuned for more surprises.